1. PhaseGuide technology – provides unique asymmetrical vertical pattern for room-filling coverage when mounting near wall-ceiling boundary. 2. Provides improved room visual appearance – for demanding interior designs by eliminating center-of-ceiling or wall-mounted loudspeakers. 3. Nominal 90° horizontal coverage – designed for in-ceiling mounting near room corners. 4. High-frequency compression driver – for best-in-class audio quality with superior frequency response and coverage consistency versus typical dome tweeters. 5. 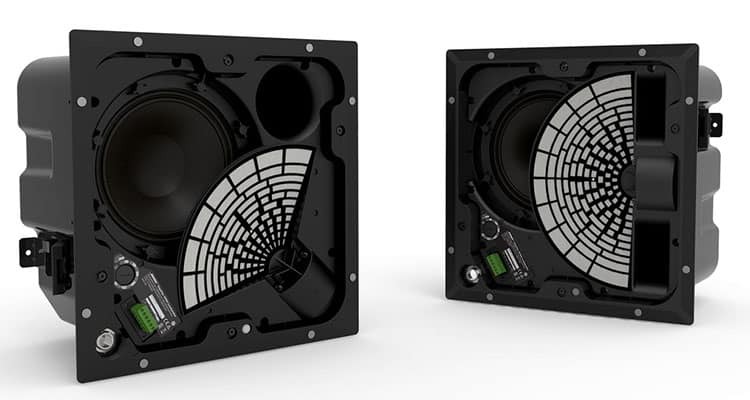 8-inch woofer – with wall-boundary loading provides extended bass impact. 7. New auto-hold, spring-loaded mounting arms – for fast, easy installs. 8. Magnetically attached grill – for quick access to wiring and tap settings. 9. UL1480A listing – for air-handling (plenum) space installation.